This video was made before this blog, and therefore, never got a mention. I think it might be my favorite thing I’ve ever done in the whole world. Vastly delayed credit goes to the actress, Ashley Lindenberg, whose demure classiness really distracts the eye away from what a horrible dancer I am. Also, this video made me think I should go back to parting my hair in the middle, but I’m not sure I have that hairline anymore. A lot of people ask the same question, so I might as well answer it. 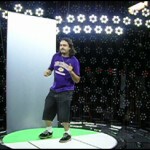 The “time machine” in this video is a light stage at the Institute for Creative Technologies in Culver City, CA. 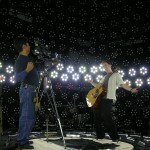 It’s built for 3d modeling, but we used it for its shiny, flashing lights. Also, no, I cannot get you access for your shoot.